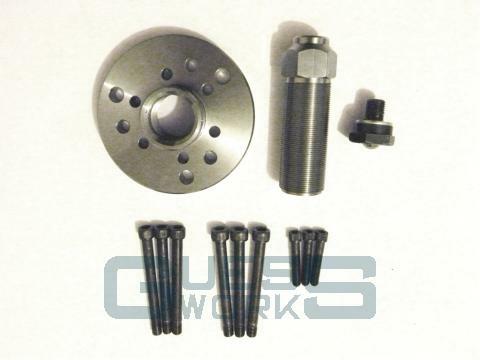 Designed to take the abuse of impact wrenches and lump hammers to remove all types of flywheel and torque converter from the transverse A and A+ series engine. Made in the UK, it is supplied with a special crankshaft insert which not only minimises turning friction on the main bolt, but also catches the flywheel when it is release by the taper, a great safety feature. Supplied with 3 sets of HT steel screws, a set for Diaphragm clutches, a set for Verto Clutches and a set for the Automatic Torque converter. This is a rental unit, the charge for rental is £20+vat, and there is a deposit of £75+vat which will be returned when the tool is returned.